The staffs at Morocco Why Not are ardent bird watchers and if you are an enthusiastic bird watcher, you will find Morocco to be an ideal location for the bird watching hobbyist who is planning a trip to Morocco for the best bird watching sites. Morocco’s feathered population consist of Black Kites, Short-toed Eagles, Lesser Kestrels, Egyptian Vultures, Ospreys, Black Shouldered Kites, Sandpipers, Gulls, African March Owls, Bald Ibis, Desert Sparrows, Montagu’s Harrier and much more. For the hobbyist birdwatcher, between the months of March to May are the better months to enjoy viewing a wide variety of species, resident and migrant birds. This period is spring and the temperatures are generally mild and sunny. The more observed migrant birds are waders and raptors. The Lesser Kestrels will pass through the northern half of Morocco during the month of March, and you will find bird species such as the Egyptian Vultures, Black Kites, Short-toed Eagles and Hen Harriers in the months of March to April, and the Honey Buzzard are more likely to be seen during April. Hobbies, Booted Eagles, and Ospreys will pass through during March to May and the migrant Montagu’s Harriers pass through at the end of the March until the start of May. Waders such as Grey Plovers, Curlew Sandpipers, Greenshank, Wood Sandpipers, Stilts, Dunlins and other waders migrate between March to May. Breeding generally begin in March and goes through June in the plains north of the Atlas Mountains. The seasons are very much the same in the desert areas. Sand grouse breed when the weather starts to get hot during the June months. In the very hot months of July and August the heat is close to unbearable in the semi-desert and desert areas and by then breeding is over and in August some species, such as the Black Kites, Egyptian Vultures and Booted Eagles will start their migration. November is an excellent month to visit as wintering birds have already arrived in the country and the month can be very wet, which makes the wet lands along the Atlantic coast to be an ideal area to visit. The months of December and January are generally mildly cold but there is so much sunshine. Our bird watching friends at Morocco Why Not will be happy to take you along a trip to the Draa valley, Ouarzazate and into the famous dunes of Merzouga where there is a seasonal lake in the desert that attracts hundreds of birds during the wet seasons. 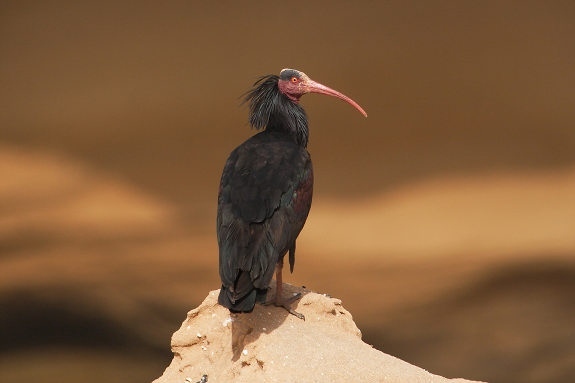 The birdwatcher in you will find something interesting in Morocco, along the deserts, in the mountains and the valleys. Just keep in mind that some places may be better than others and this is dependent on the time of year.